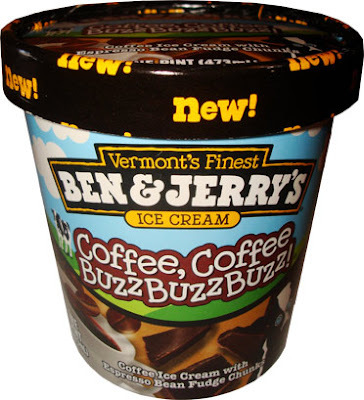 New Ben & Jerry's Coffee Coffee Buzz Buzz Buzz! Before we begin this review I have a story to tell you about finding this flavor. It all started on a windy day back in late February. I had stopped at a grocery store after classes to grab myself some lunch and decided to wander the ice cream aisle while my order was being completed. I couldn't believe my eyes when I spotted two of the new Ben & Jerry's flavors in the case. I knew Dubba would want to try the mint cookie so I was contemplating picking up Coffee, Coffee Buzz Buzz Buzz! (yeah I'm not typing that out anymore). I realized I left my insulated bag at home and didn't know how long it would take me to get the pint to my freezer. I decided to forgo purchasing it and then stop back a few days later. That was a big mistake. Upon returning to the store, I noticed ccbbb was nowhere to be found. After finding an employee I was told that they had found some leftover inventory from the flavor that was on clearance to make room for ccbbb. Management wanted them to unload those products before selling the new stuff. This seemed understandable, so I convinced myself it wouldn't be more than a few days until it was back on the shelf. I was wrong once again. After going to the store multiple times over the next couple of weeks I started to lose hope. That is until earlier today when I saw that they were in the act of stocking cccbb again. I didn't even let the employee put the pint in the freezer. I literally swiped it from his hands and ran to the self-checkout. I kid you not, I was that eager to finally get my hands on a "new" Ben & Jerry's flavor. Now here we are and it's mine, all mine! Technically, it's not a new flavor. Just like last year's arrival of Chocolate Therapy, Coffee Coffee Buzz Buzz Buzz! was a scoop shop exclusive flavor, though technically it was in the flavor graveyard. Yeah, I'm just as confused as you are. Whatever the case may be, it's now in pints for your eating pleasure. So what exactly is CCBBB? According to the pint it's “Coffee Ice Cream with Espresso Bean Fudge Chunks”.Now it doesn't sound like the most inspired flavor, but hey, compared to the new frozen Greek yogurt flavors B&J's is pushing out, it's a god send. I have had B&J's coffee ice cream before in their Coffee Heath Bar Crunch and enjoyed it so I'm hoping I'll have the same experience with this flavor. Removing the lid, it looks exactly how you would imagine it to. It's a nice tan color with a few espresso chunks peeking through. Digging in, I'm met by even more chunks. Not being shy to try a new mix-in, I happily crunched into one. I was met with a nice espresso flavor with hints of chocolate on the end. It was almost like a perfectly balanced mocha coffee, just in chocolate form. These tiles are full of flavor and aren't for the people who like to drown their coffee with chocolate. Also when I said crunched, I meant it. 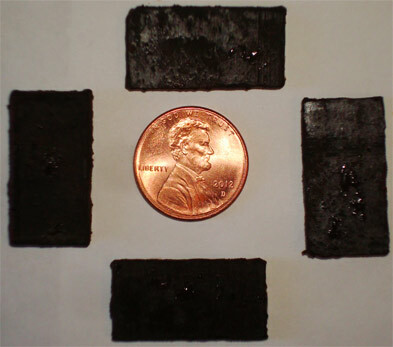 These chunks add a pleasant thud every time you bite into one which is very often seeing as they're everywhere. 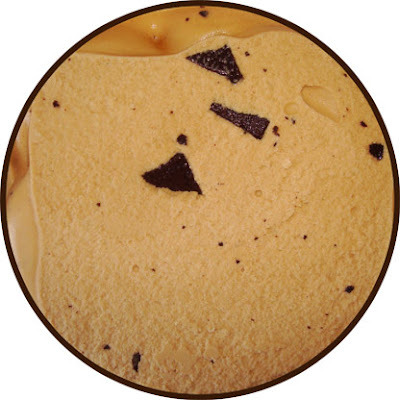 The base coffee ice cream is exactly the same as you find in Coffee Heath Bar Crunch. It's robust and not overly sweet like most coffee flavors tend to be. Ben & Jerry's doesn't mess around so they let their coffee beans shine through in this application. I find myself loving the contrast in the flavors here. 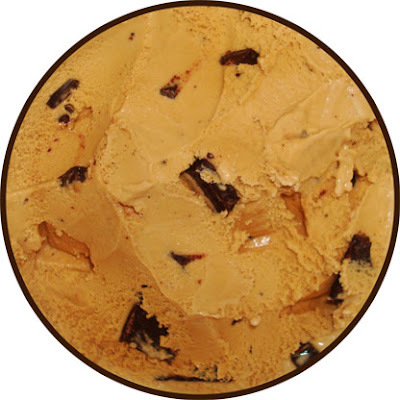 The coffee ice cream and espresso chunks just work in perfect harmony to produce a very bold flavor profile. I might even go so far as to say that this may be my new favorite coffee flavor. Now did it give me a buzz buzz buzz? I'm not sure but that doesn't matter because my taste buds sure got one. Great job Ben & Jerry's on successfully transitioning another scoop shop exclusive flavor into pints. Now can I get some Butter Pecan in pints next year? On Second Scoop: I couldn't help myself and needed to have some more ccbbb with my breakfast this morning. This espresso chunks are just amazing. They might also be one of my favorite Ben & Jerry's mix ins. They're just so addicting and full of flavor, it's ridiculous. I remember Dubba saying scoop shops tend to sell their mix ins so I think I might have to go buy a bag of these. Okay, I have nothing else to say. Go get some of this! Verdict? My new favorite coffee flavor?! with the name I thought the same thing, but nope, the flavors will coexist. Micky, I believe it's replacing dublin mudslide as a coffee flavor. I gotta get some of this. You won't regret it, Steve! Good to know I'm not the only one who thinks so. Oh and +1 for your name drunksmoochum. Pokemon references ftw! Not sure if you've tried it, but if you want a delicious espresso fix for a lower price, get Edy's Grand Espresso Chip… Deelicious; albeit I have yet to try this one, but hey, it won't hurt to try? Anon, I've been meaning to try out that flavor but I've only seen it a few times awhile back and haven't found it since. I'll definitely keep an eye out and be sure to let me know what you think of this flavor when you give it a shot. We used to get this flavor in the the grocery store over 15 years ago and then it just disappeared. My husband loved it and we never could find out what happened to it. We even wrote to the company. Also didn't see it in the "grave yard" at first. We gave up but never forgot about it! Today I saw it at the store and almost fell over. It felt like I was in the twilight zone. My husband was very happy to have it again after more than 15 years without it. Anon, yeah I guess it went to the graveyard but it has been available at scoop shops exclusively for awhile. I'm glad it's back in pints though because I doubt I ever would have chose it as an option at a scoop shop. This has always been in the scoop shops. I'm not sure why you think it would be in the Flavor Graveyard if it was never eliminated. The Flavor Graveyard is for flavors that have been completely eliminated, not just those that are no longer in scoop shops or prepacked pints. Anon, I said it was confusing but like Dubba mentioned, it had a spot in the flavor graveyard at one point. I definitely misread in my haste. I apologize and stand corrected! Keep up the good work! It's all good anon! Ben & Jerry's likes to keep us on our toes. Would you say that this is better than Voluntiramisu? Stride, I've never tried Voluntiramisu seeing as flavors including alcohol are normally a turn off for me. This is the best coffee ice cream I've ever had though. I'd say give it a shot and let me know what you think! I accept your request and after eating a pint of it I must say that this is a good ice cream, although I would not say it is my favorite coffee ice cream ever. I wish the ice cream base was a bit sweeter but I love the fudge covered espresso beans which complemented the ice cream well. I agree with you wholeheartedly in that this is not for those who like to drown their coffee ice cream in chocolate. I think Bonnarroo Buzz is way better than this ice cream and one of the best coffee ice creams I have ever had. In addition, I have never had the Coffee Heath Bar Crunch ice cream but assuming that I love Heath Bars, I would probably prefer the Heath Bar Crunch over Coffee Coffee Buzz Buzz Buzz (CCBBB). I also liked Voluntiramu a bit better than CCBBB. In summary, CCBBB isn't breaking any boundaries but it's good to try at least once especially for coffee lovers. Thanks for the input, Stride. My favorite coffee flavored frozen dairy dessert is Stonyfield's nonfat "Gotta Have Java" and my second is Bonnaroo Buzz. Ben and Jerry's coffee ice cream has a coffee flavor a tad too strong for my preference. I thought the fudge covered espresso beans in CCBBB tasted like Nestle Crunch bars because I could not detect a strong coffee bean flavor from them; only the chocolate is what I detected. And I thought they were going to be round shaped instead of rectungular shaped. Having said that, CCBBB tasted like coffee with chocolate chunks to me which is why I found this flavor too boring. Really? I have retried the gotta have java flavor and have a future review for it but I wouldn't call it my favorite. I guess I just like the strength of B&J's more. I honestly could barely taste the chocolates in my chunks. Even when i removed them completely from the ice cream the dominant flavor was definitely coffee. I guess we all have our different taste differences. I am interested in reading your review for Stonyfield's "Gotta Have Java" because I bought this approximately 10-15 times last year. Stride, I have a big backlog right now but I'll try to get it up asap for you. Nick, after trying Haagen-Dazs' Cappuccino gelato, I am revising my list of favorite coffee-flavored ice creams/frozen desserts. Haagen-Dazs Cappuccino is now my favorite coffee-flavored frozen dessert with Stonyfield's "Gotta Have Java" frozen yogurt in second. Haagen-Dazs's Cappuccino gelato is amazing. You've gotta try it! Stride, I've actually been on the lookout for that one. I've been fiending for a new coffee flavor to try. Good to hear you enjoy it and hopefully I'll be able to get my hands on it soon! jr, ice cream bread?!?! I want details. I'll have to give it a try sometime! Don't wait...try it NOW! It is my fav flavor of all time. Love coffee and espresso choc is to die for. Always have in my freezer. Good work B&J. Anon, I've already tried it=p That's how I wrote the review and all. I was talking about that ice cream bread jr mentioned. We wanted to try this coffee coffee buzz buzz buzz. It was at the cleveland zoo. We loved it. I remember CCBBB when it first arrived on the scene since I lived in VT at the time and my son worked in B&Js production. Originally, I believe it was listed as "Dark Coffee Ice Cream with Dark Chocolate Covered Roasted Coffee Beans". I remember it having the whole beans in it. I hadn't seen it around since I left VT in 2003, but it showed up last year at the Kroger grocery store here in KS. I was disappointed in the "chunks" of chocolate . . .but it's still my favorite ice cream, and I have some in front of me right now! I used to buy this years ago until the stores stopped selling it. I'd find it in their ice cream shops now and then. This is my FAVORTIE ice cream flavor in the whole world! Just perfect!